Both the form and the material of this faience alabastron ultimately derive from Egypt. An alabastron is a container for perfumed oil that takes its name from alabaster, the material from which the original Egyptian examples were made. Greek artists adopted the Egyptian alabastron's shape in the 600s B.C. but made the vessel in a variety of materials. Faience is made from quartz silicate, which produces a glass-like glazed surface when fired. The body is decorated with stripes and narrow bands of patterns in blue and brown against a white background. The mouth and foot are decorated with a rosette. The lack of figural decoration is unusual. 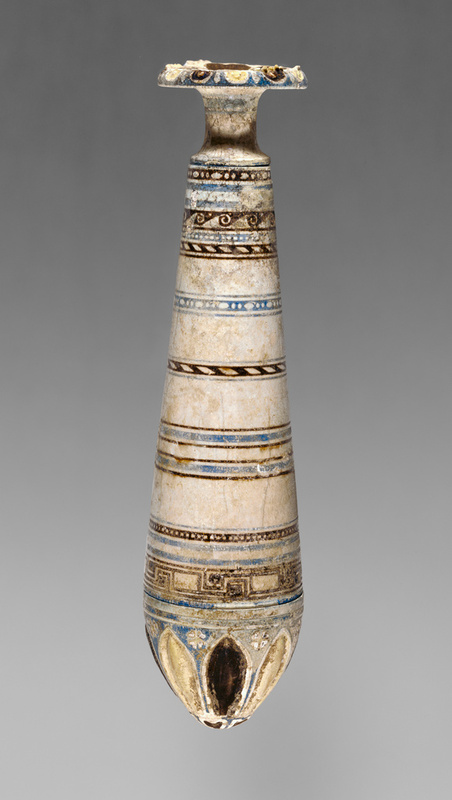 The white faience of this vessel is also rare and may have been meant to mimic the appearance of ivory or alabaster. The alabastron was made in three pieces: the mouth and foot were molded, and the body was formed on a potter's wheel. Jean-Louis Domercq (Paris, France), sold to the J. Paul Getty Museum, 1988. "Acquisitions/1988." The J. Paul Getty Museum Journal 17 (1989), p. 114, no. 22. The J. Paul Getty Museum Handbook of the Collections. 3rd ed. (Malibu: J. Paul Getty Museum, 1991), p. 55. Parlasca, Klaus. "Einige Meisterwerke syrischer Kleinkunst des Hellenismus und der fruehen Kaiserzeit", Damaszener Mitteilungen 5 (1991), pp. 49-58, p. 51; pl. 21 e.
Towne Markus, Elana. Masterpieces of the J. Paul Getty Museum: Antiquities. (Los Angeles: J. Paul Getty Museum, 1997), p. 67. The J. Paul Getty Museum Handbook of the Antiquities Collection (Los Angeles: 2002), p. 100. Spivey, Nigel and Squire, Michael. Panorama of the Classical World (Los Angeles: Getty Publications, 2004), p. 27, fig. 33. The J. Paul Getty Museum Handbook of the Antiquities Collection. Rev. ed. (Los Angeles: J. Paul Getty Museum, 2010), p. 100. Picon, Carlos, and Sean Hemmingway, eds. Pergamon and the Hellenistic Kingdoms of the Ancient World (New Haven and London: Yale University Press, 2016), pp. 230-231, no. 165, ill., entry by Alexis Belis.